The weather from Samos to Pyraeus was calm and the ferry much larger than the Kusadasi-Samos one, so the ride was smooth and uneventful. We docked at 4:00 Tuesday morning. Not the best time to arrive in a new city. There was a metro station a short walk from the dock that I used to get to downtown Athens. Once there I killed time at an all night bakery before checking into Hotel Tempi at 7:00 for seven thousand drachma a night, about $17. It was a decent room with a sink, and the hotel was in walking distance of all the main attractions. 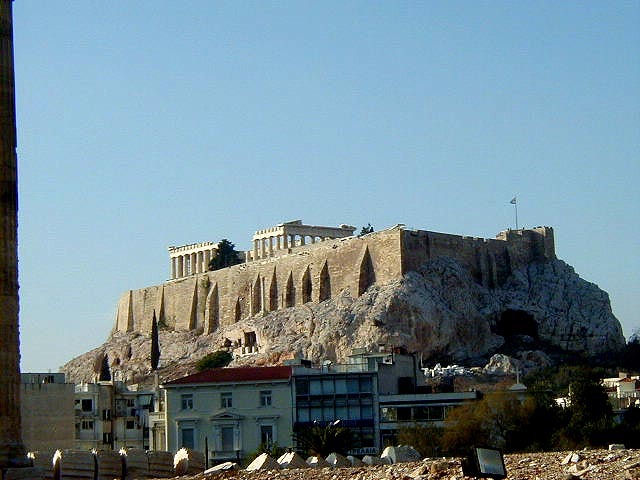 Athens is an ugly sprawling concrete city with endless traffic jams during the day, incredible archaeological sights on and around the Acropolis, and a terrific archaeological museum. If seeing old stuff isn't your thing, you won't like Athens. There may be reasons other than archaeology for visiting, but I don't know what they are. 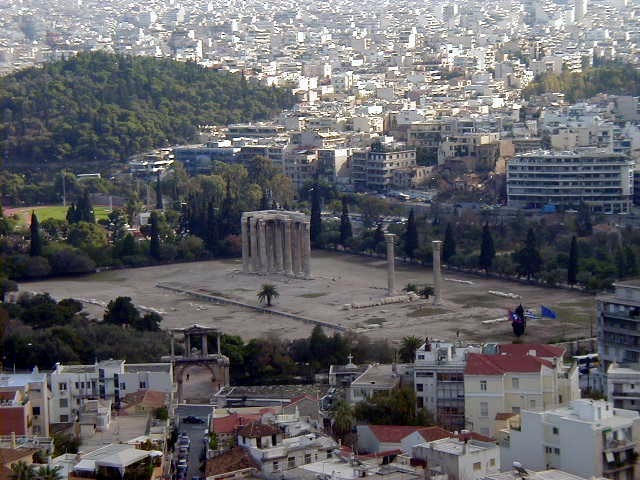 The modern city isn't much to look at, but what remains of ancient Athens is extraordinary. I like these pictures. 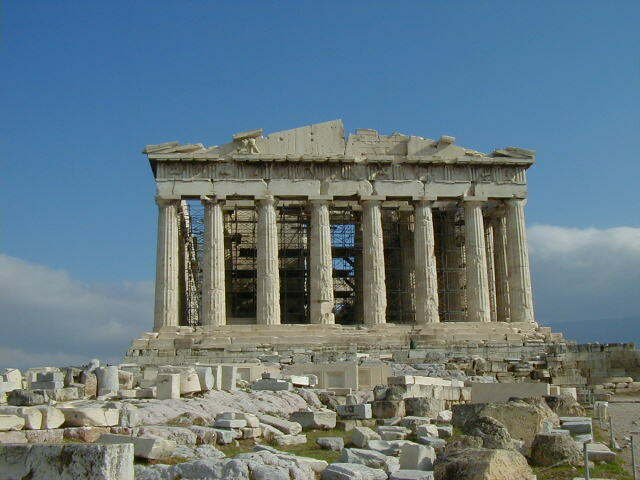 I'll do the outside stuff first, starting with everyone's favorite, the Acropolis. 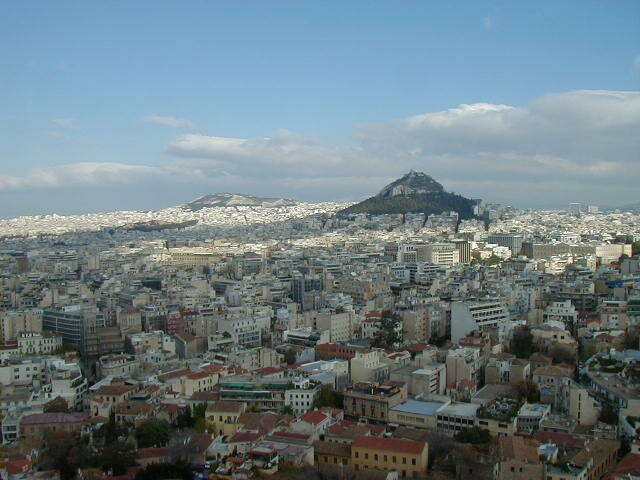 You can see the Acropolis from almost anywhere in Athens; it is on a hill rising from a mostly flat city. The hill has been occupied since the stone age, and had religious significance and important temples long before the current structures. The Persians destroyed everything on the Acropolis in 580 B.C. 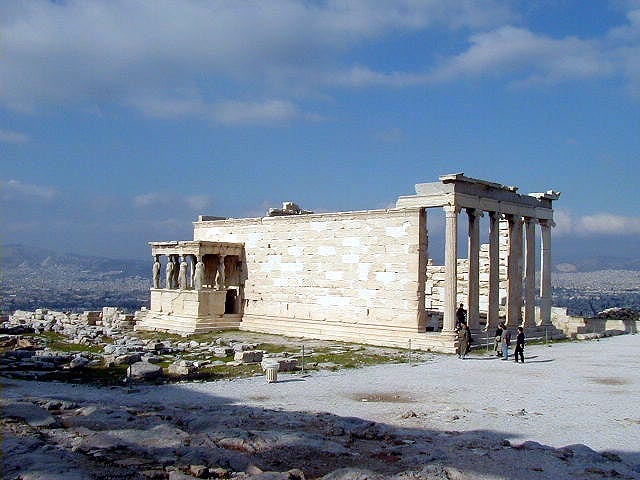 What is on the Acropolis now are the remains of the building program initiated by Pericles in the fifth century B.C. 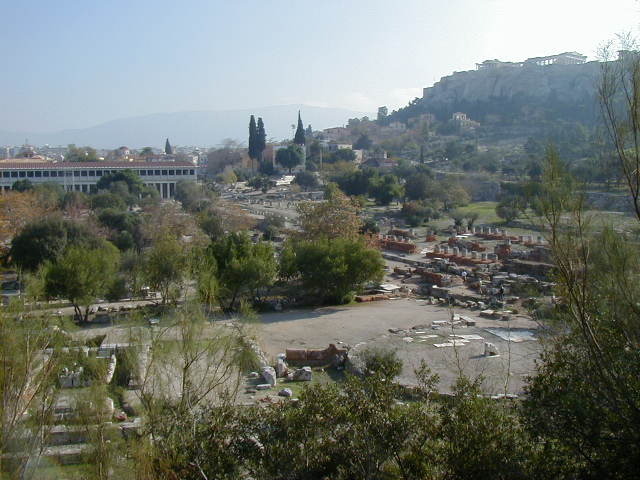 The first picture shown was taken from east of the Acropolis. 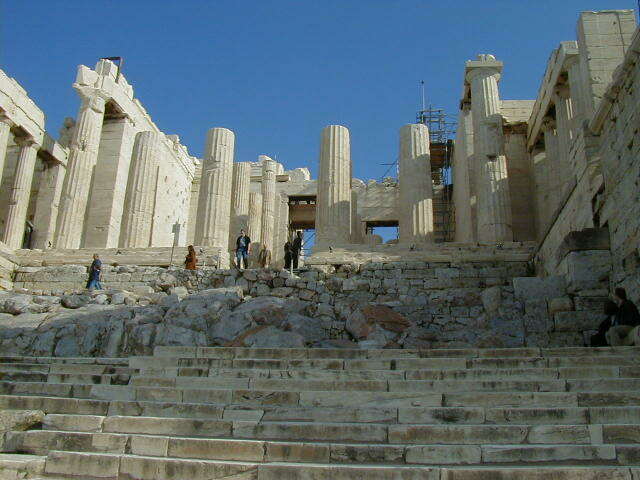 After that is the entrance to the Acropolis, the west face of the Parthenon, the east face of the Parthenon, and my face in front of the Parthenon. Didn't see that one coming, did you? 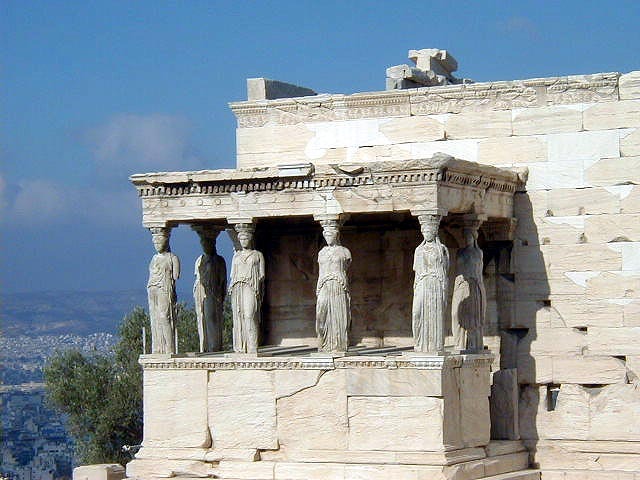 After my photo is the Erechtheion, to the ancient Greeks the most sacred place on the Acropolis. It is built on the spot where Poseidon struck the ground with his trident and Athena created the olive tree. It also has the Portico of the Carytids. 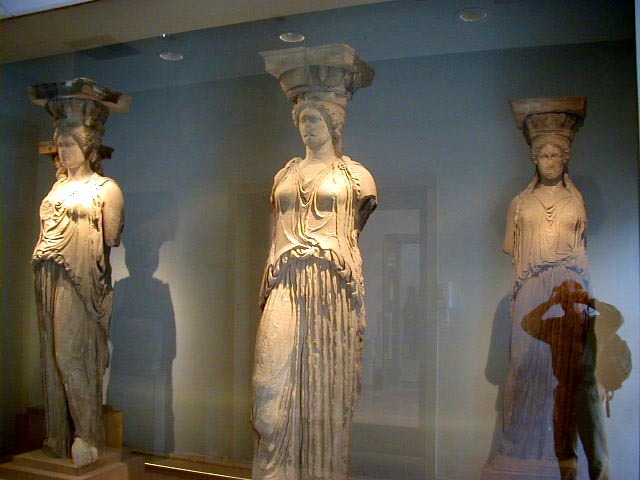 Those shown are copies, the originals were removed to the Acropolis Museum for safe keeping. 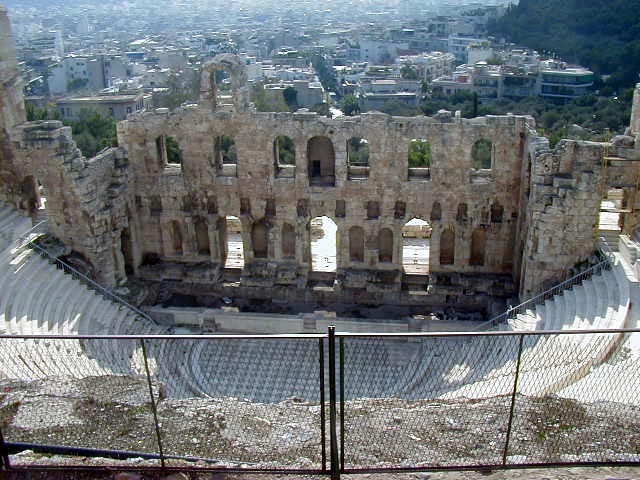 Last of this little series is the Theater of Herodes Atticus. I had to look at it from a distance. 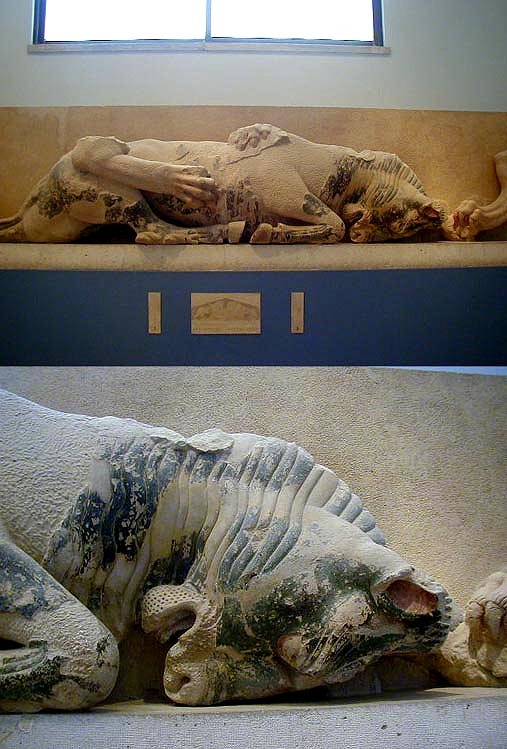 That last picture illustrates a big difference between seeing ancient sites in Greece and seeing them in Turkey. Greece has better reconstructed sites, but limits access to them. In Turkey you can climb all over, around and sometimes under the sites. 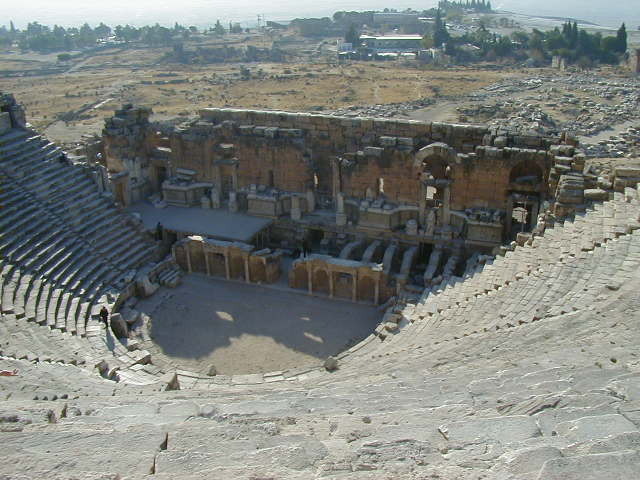 Remember the Theater in Pamukkale? 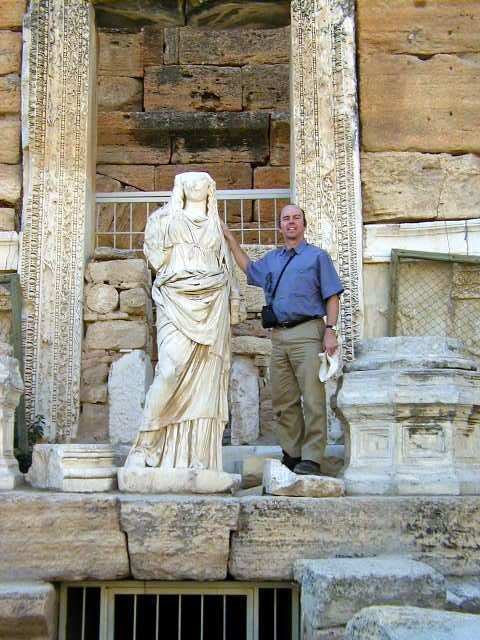 Oh well, wondering all over the ruins in Turkey is fun, but Greece is right in protecting its sites. 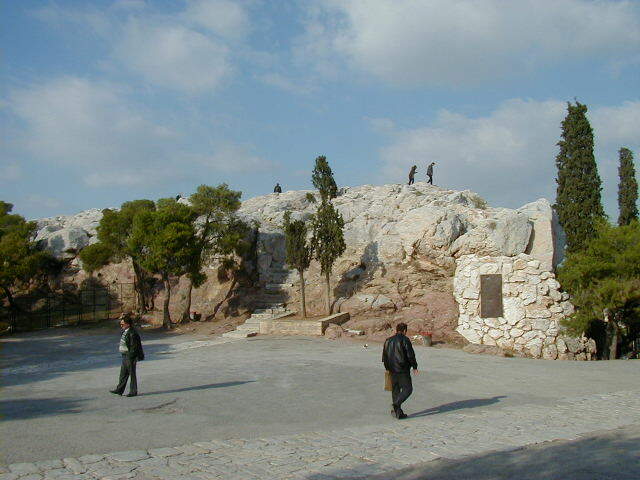 Just outside the entrance to the Acropolis complex, still on the hill, is Judgment Rock. This is where Socrates was condemned to death in 399 B.C. and the Apostle Paul preached around 49 A.D. It isn't much to look at, but some important history happened on this rock. On the Acropolis is the Acropolis Museum. It's a good place for a museum with that name. Inside are remnants from before the Persian destruction and the original Carytids, behind protective glass. 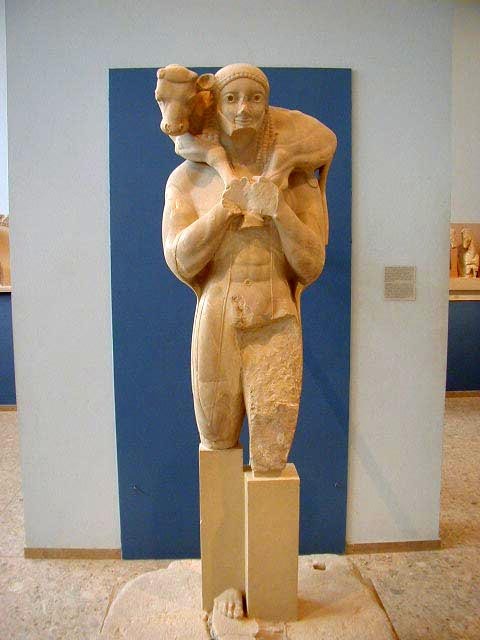 The first statue shows the Egyptian influence on early Greek art, but also shows how the Greeks were going beyond the Egyptians. Egyptian civilization goes back five thousand years, so it was ancient even to the ancient Greeks. The Egyptians had a theocratic form of government, which was remarkably stable but resisted innovation. Theocracies often do that. 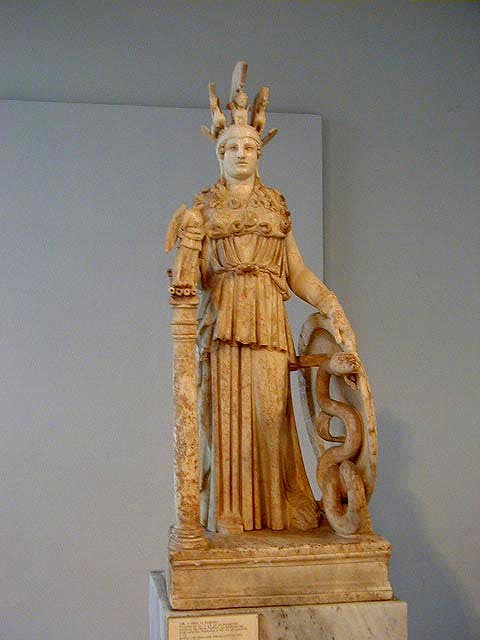 Their art advanced very little over three thousand years, while the Greeks started with Egyptian art and took it to a level that was not surpassed until the Italian Renaissance. That's my engineering analysis of it, anyway. I didn't take that from a guidebook, honest! 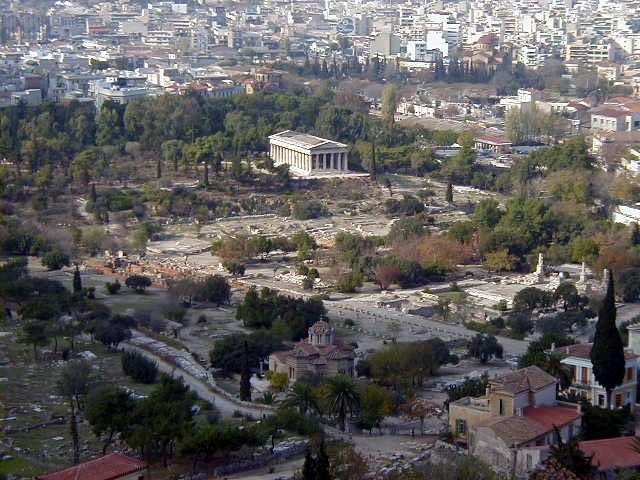 From the Acropolis are intriguing views of the Temple of Olympian Zeus and the Temple of Hephaestus. 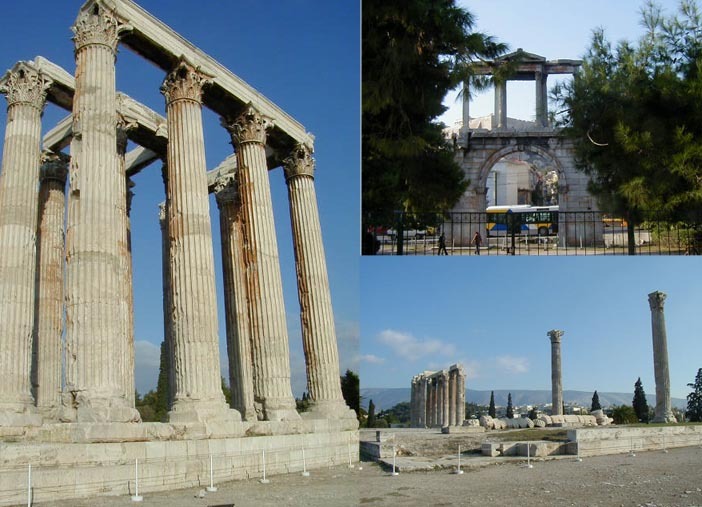 Zeus' temple, shown in the next two pictures, was started in the sixth century B.C., but kept running into wars and financial problems. It was not finished until 131 A.D. when the Romans got involved. The top corner of the collage shows the entrance to the Temple. The Temple of Hephaestus was finished in 449 B.C., and may be the best reconstructed/preserved ancient Greek temple in the world. Unfortunately it is off limits. Someone told me it may be open to the public for the 2002 Olympics. 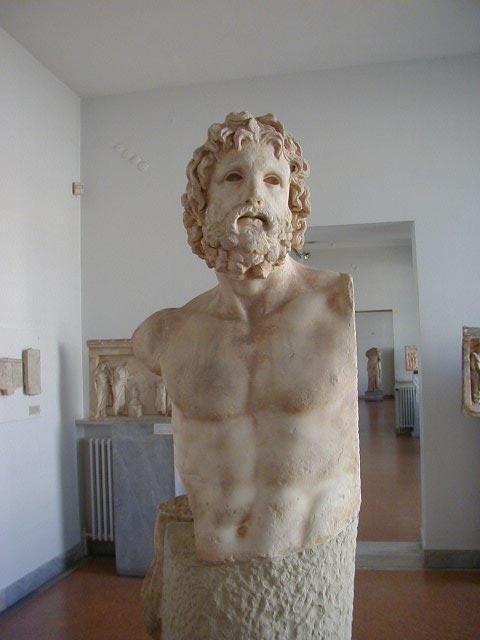 Hephaestus was the god of fire and industry, and was the craftsman of the deities. Must have been an engineer. When Zeus decided to punish man, he asked Hephaestus to create woman. So Hephaestus created Pandora out of water and clay. I'm not sure what we did to deserve that. 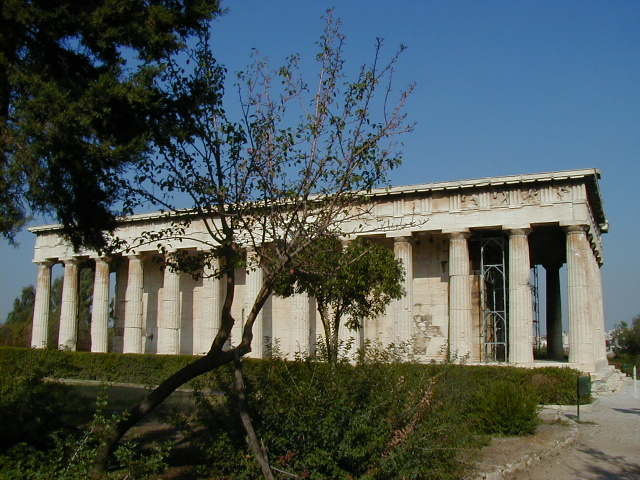 The Temple of Hephaestus is on the west end of the Agora, the meeting and market place of the ancient Greeks. There isn't much left of it, it was destroyed in 267 A.D. and built over. After the Greeks won independence early in the twentieth century the buildings on top were demolished and the Agora excavated. 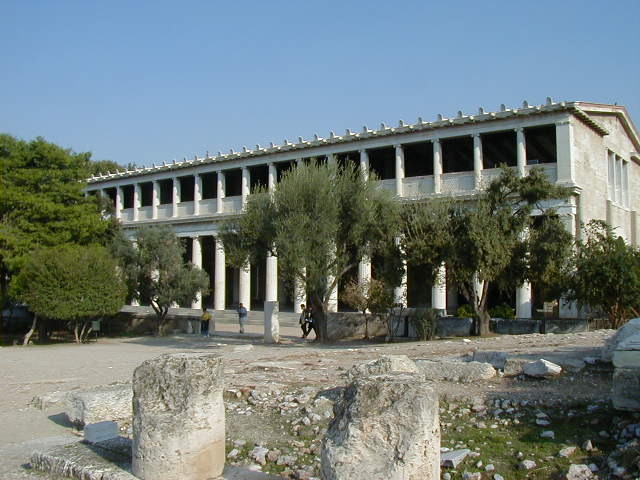 On the east side is the reconstructed Stoa of Attalos, now used as a museum. Attalos II was the king of Pergamon in the second century B.C., and built the stoa as a goodwill gesture. I told you Pergamon was once a rich kingdom. That does it for the outdoor stuff. 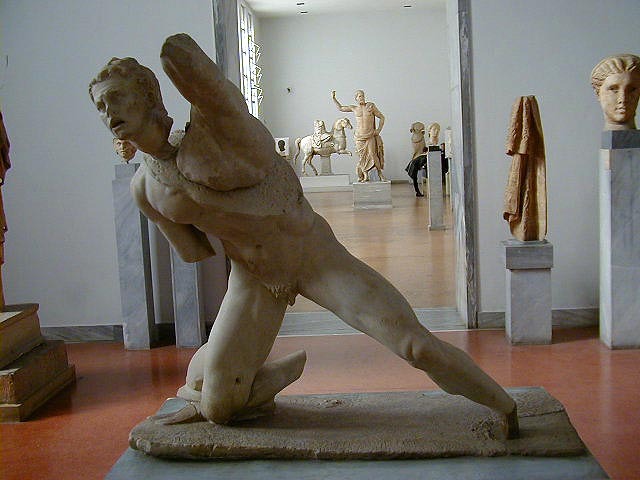 I also spent a lot of time in the National Archaeological Museum in Athens. I like sculpture and had a good time in this museum. 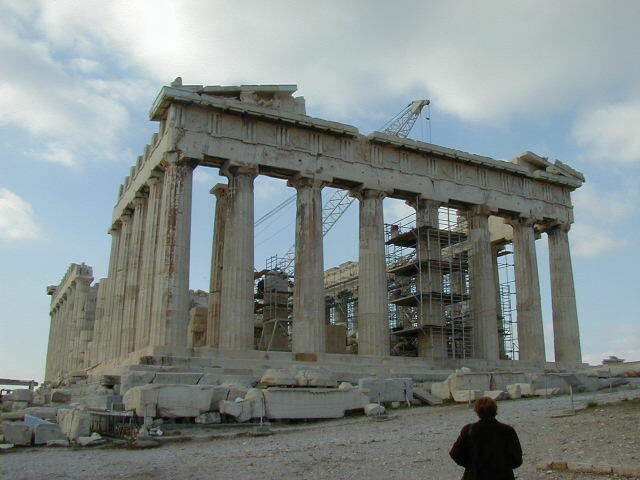 Here are some of my favorites, starting with a copy of the Parthenon Athena. The original was made gold, MFEM and ivory and was almost 12 meters high. 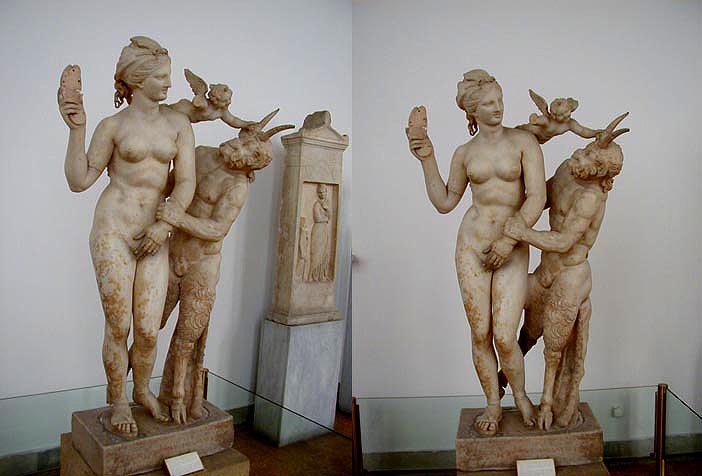 This is my all time favorite sculpture, Aphrodite, Pan and Eros fooling around. It was done around 100 B.C., after the Classical era. During the Classical era the gods were always depicted looking serious and pre-occupied with important thoughts. Here we get to see the gods misbehaving. I like it. 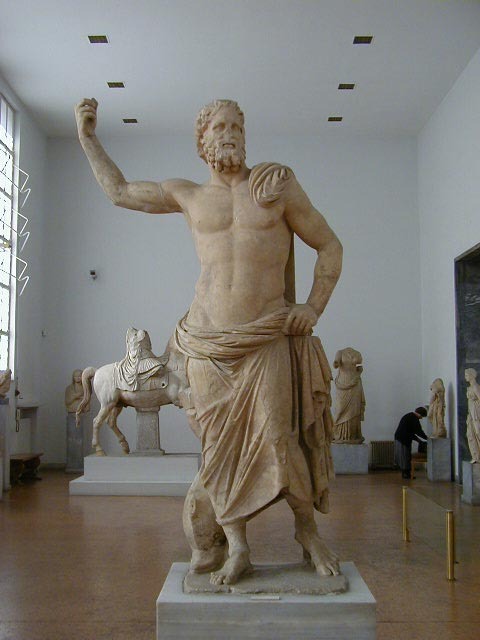 Other marbles are Asclepios--god of healing and namesake of the Asclepion outside of Pergamon, Poseidon of Melos (Melos is where the statue was found), a defeated warrior (a very common theme), Aphrodite after her bath (a really, really common theme) and Diadoumenos. 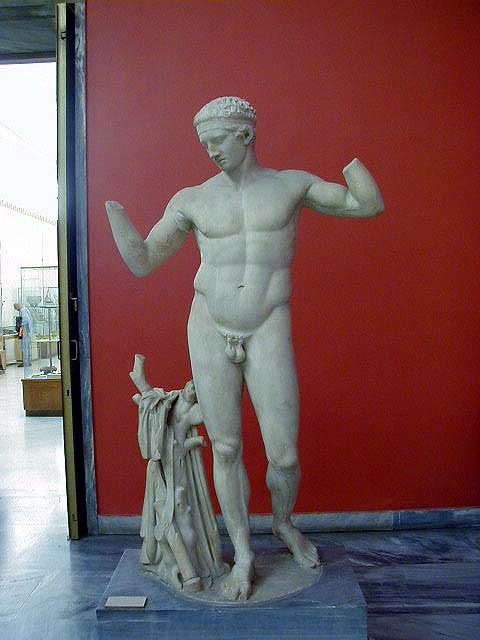 Diadoumenos, also know as "Mime in a Box", shows the influence of the ancient Greeks on our higher art forms to this day. 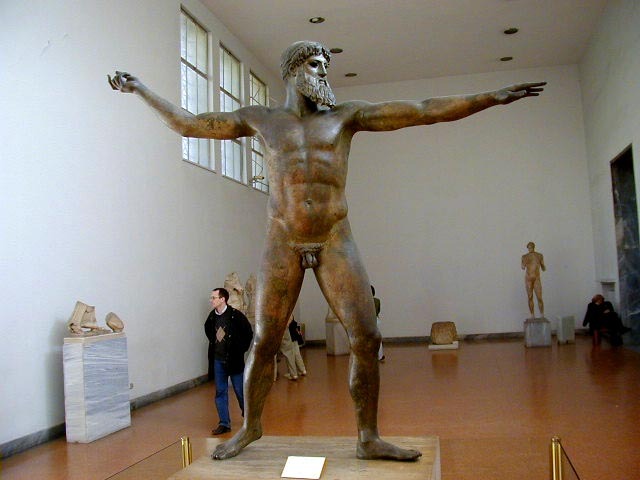 The museum also has important bronzes, including what may be the most famous bronze statue in the world, the Poseidon of Artemision. Cast in approximately 450 B.C., it was hauled out of the sea in 1928. 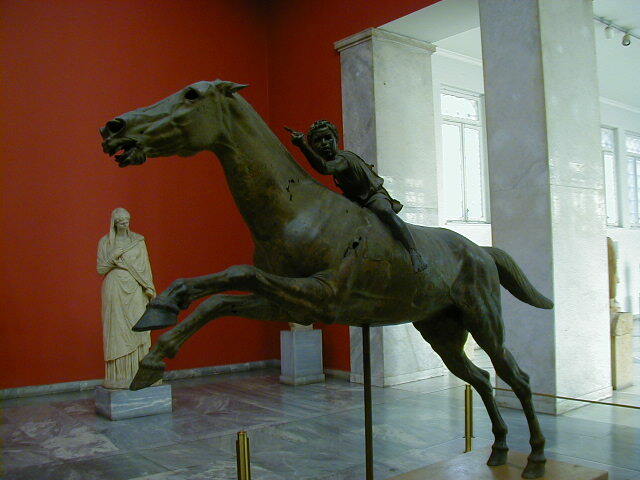 Following the Poseidon picture is a bronze of a child on a horse, also from Artemision. If I remember the story correctly, a fisherman cast his net off the Artemision peninsula and pulled up part of the cargo from an ancient shipwreck. That was some some catch. 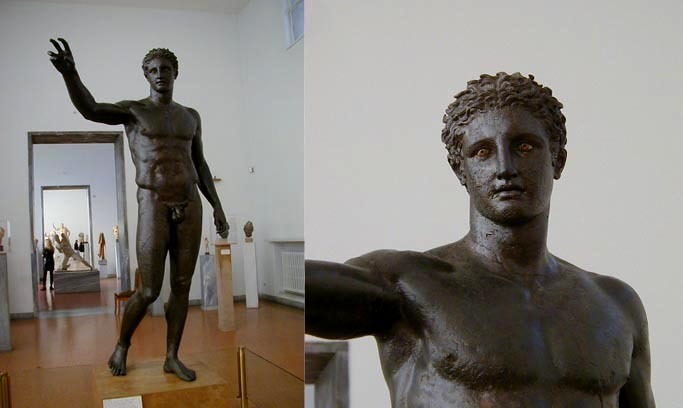 Poseidon is nice, but I liked the bronzes that still have the eyes. When I look at a face with empty sockets I see a statue, but when I look at a face with these realistic eyes, the statue seems to come to life, in a really spooky sort of way. 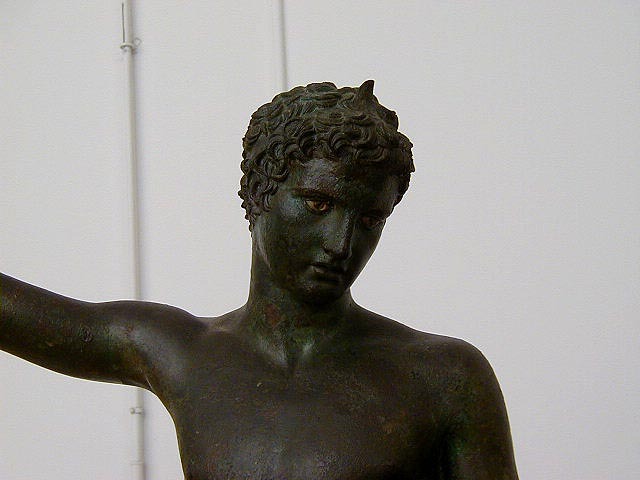 This is the Philosopher of Antikythera, the Youth of Marathon, and the Youth of Antikythera. 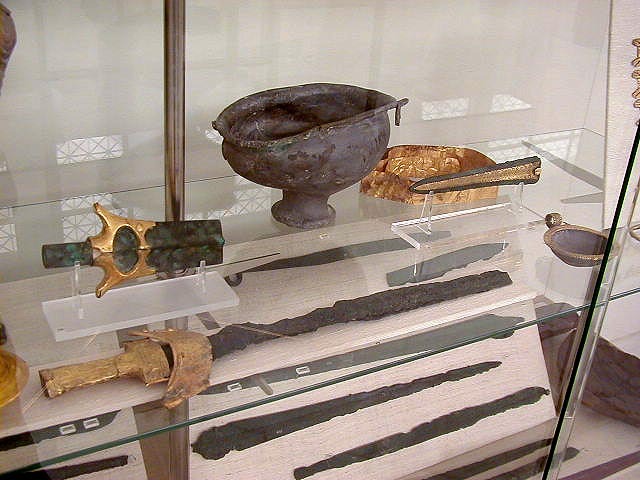 In addition to sculptures and bronze statues from 2000 to 2500 years ago, the museum has some old stuff. 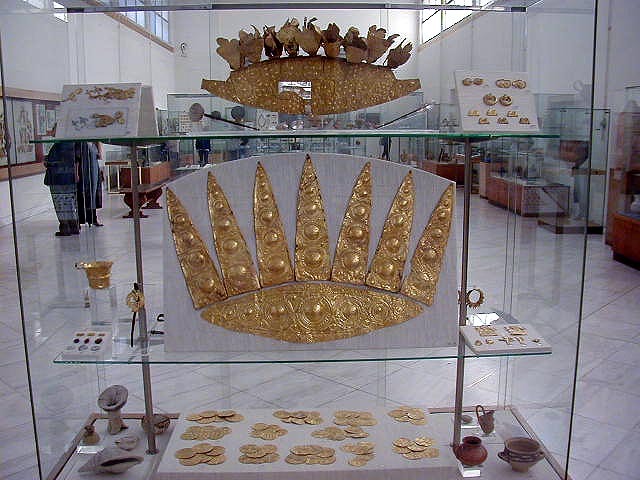 It has an incredible collection of gold Mycenaean artifacts, including the famous misnamed Death Mask of Agamemnon. It was found by Heinrich Schliemann, the discoverer of Troy, who thought he had the death mask of King Agamemnon of the Trojan War. Actually the 16th century B.C. 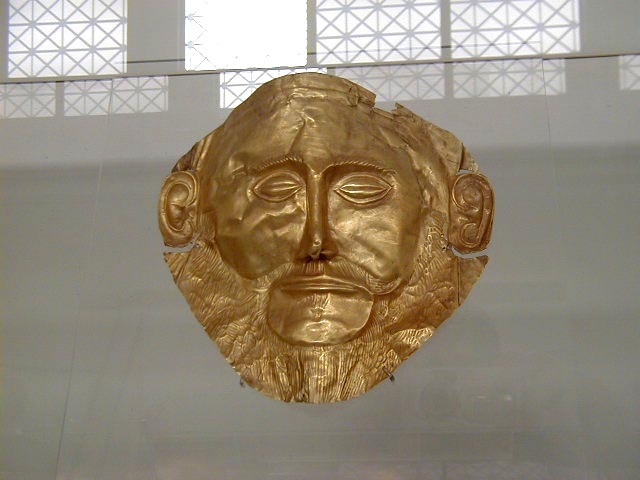 mask is from three centuries before Agamemnon's time. I don't have a story for the other artifacts, I just thought they were pretty. 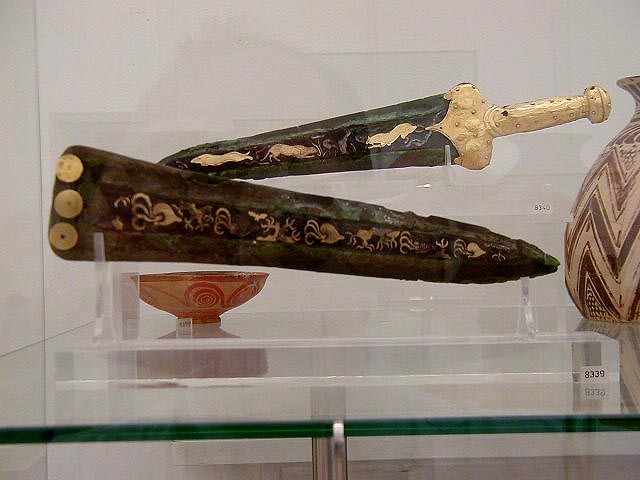 I was especially impressed by the gold decoration on the bronze daggers. 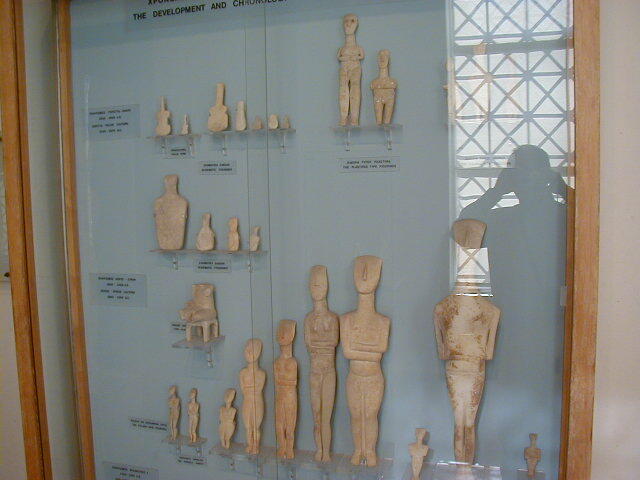 There is also a hall of Cycladic art, primarily the Cycladic figurines from 3000 to 1100 B.C. 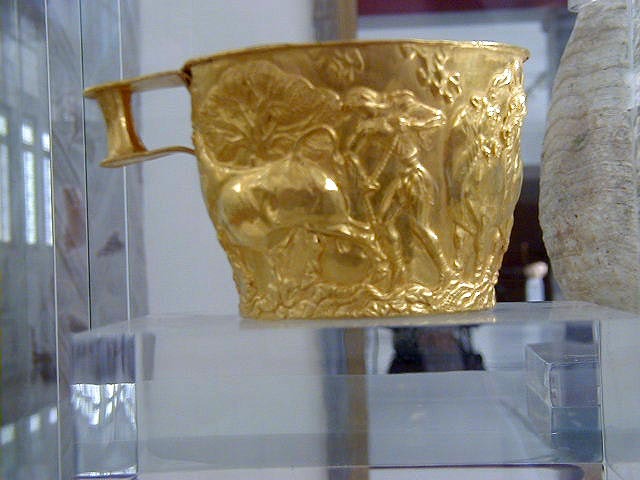 Not as flashy as the Mycenaean collection, but culturally important. Similar figures go back many thousands of years. 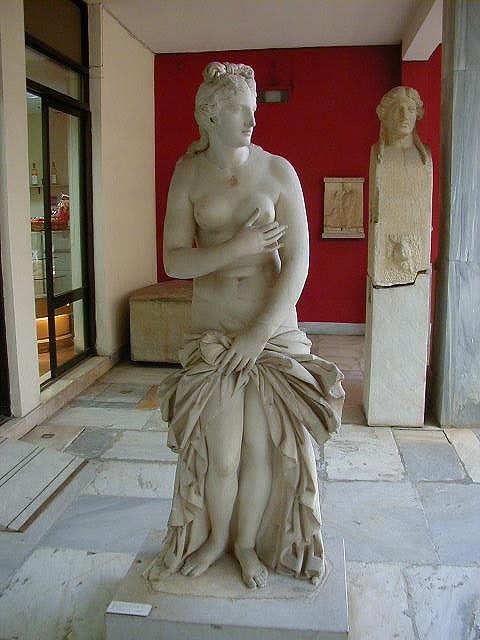 People have been preoccupied with the female body and recreating it in various art forms far back into the stone age, long before metal technology, agriculture, or civilization. Do you think Hephaestus realized what he was doing when he made Pandora? I only spent five days in Athens; that was all it took to see everything I needed to see. 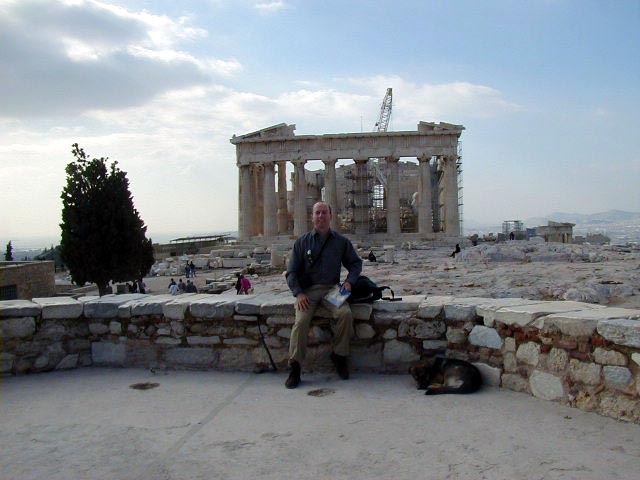 On 2 December I headed to Delphi.